Some states and Canadian provinces also require children to use a booster seat until they reach a given age or weight (e.g., 6 years or 60 lbs). Be sure to check current laws in the states or provinces where you intend to drive. The National Highway Traffic Safety Administration and Transport Canada recommend that all children age 12 and under be properly restrained in a back seat. • Carefully read the owner’s manual, and make sure you understand all seat belt instructions and all safety information. • Move the vehicle seat to the rearmost position. • Have the child sit up straight, back against the seat, and feet on or near the floor. 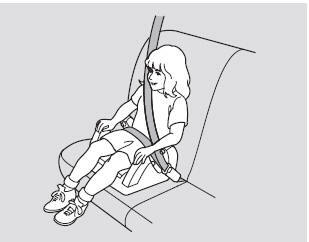 • Check that the child’s seat belt is properly and securely positioned. • Supervise the child. Even a mature child sometimes needs to be reminded to fasten the seat belt or sit properly. • Do not let a child wear a seat across the neck. This could result in serious neck injuries during a crash. 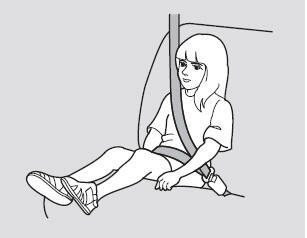 • Do not let a child put the shoulder part of a seat belt behind the back or under the arm. This could cause very serious injuries during a crash. It also increases the chance that the child will slide under the belt in a crash and be injured. • Two children should never use the same seat belt. If they do, they could be very seriously injured in a crash. • Do not put any accessories on a seat belt.